Why rent anywhere else when you can rent a car directly from Toyota? 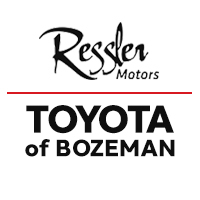 Toyota Rent a Car in Bozeman Montana utilizes the latest model rental vehicles, making it a superior car rental experience. Whether you need to rent a car for business or pleasure, Toyota Rent a Car has the dependable rental car to suit your needs for days, weeks, and even months. Need a rental car to travel into Yellowstone National Park? We have a wide variety of rental cars, trucks, SUV’s, vans, and even hybrids to get you where you need to go. Travel frequently for business? We have a corporate rental car program designed specifically for you. Flying into Bozeman, MT? We can pick you up. Need to tow something? We have large SUV’s and Trucks that are equipped to tow. Want to save gas on your long trip? Rent a Prius with an EPA estimate of 51/48 mpg! No matter the reason, we have the rental car to meet your needs. Must have valid driver’s license; At least 21 years of age; proof of full coverage insurance coverage; valid credit/debit card. Online reservations are only allowed 24 hours in advance. To make a reservation within 24 hours please call 406-585-2010. Prices may vary due to availability and seasons.